First step to prevent water from entering your foundation! 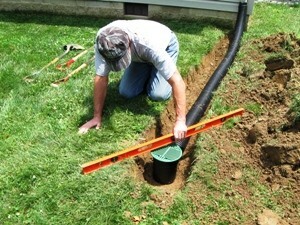 Downspout extensions are your first line of defense against water entering your crawlspace or basement. By diverting roof water away from the house, these extensions reduce the horizontal hydrostatic pressure against the foundation. 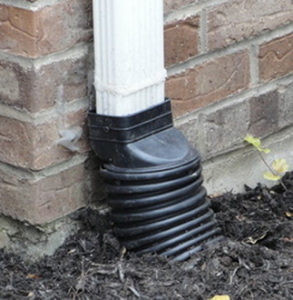 Downspout extensions are also effective in preventing foundation settlement, and the erosion of soil and mulch from around your home. 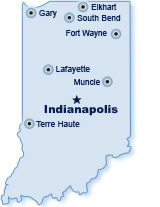 Protect your home and landscaping with quality underground extensions from Indiana Crawlspace Repair! Our Downspout Extensions are compatible with 3-in or 4-in downspouts. Sod is removed prior to excavation so the lawn lawn will look as it did before installation. Our extension pipe is made of durable, high-strength corrugated plastic, and the Bubbler Well (end of extension) is easy to keep clean. The grated lid keeps rodents and debris from entering the pipe; and can easily be removed if the drain needs to be cleaned. One of the major factors behind wet crawl spaces are homes that have downspouts dumping water near the home. 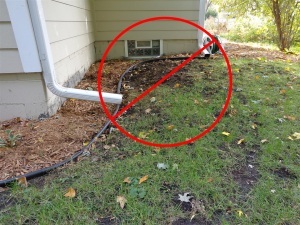 Above ground downspout extensions are unattractive, not extended far enough, and have to be moved every time you mow the lawn. Our underground downspout extensions hide ugly above grade extensions, and divert roof runoff 15 feet or more away from your foundation.